Paperback; 58 pages. For frontline employees, shows that customer complaints are a second chance to make things right. Builds tact, compassion, creative problem-solving and follow through. 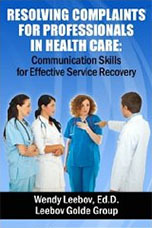 Case situations, self-assessments and practice exercises for sharpening service recovery and hospital complaint-handling. Great for individuals and groups.